With the death of THQ, many of us who were fans of the original Darksiders and its sequel assumed that it would be the last that we saw of the series. Then Nordic Games (now THQ Nordic) grabbed the license for itself, formed up a new team, and picked up the slack. It's a good thing, too. Darksiders tells the story of the four horsemen of the apocalypse, and in that context, anything less than four games in the series will leave it feeling incomplete. Is there anything more thematically appealing (insofar as sheer entertainment goes) in the Christian religion than the four horsemen of the apocalypse? The idea of violent hell-beings on horseback heralding in the end of days has captured the minds of people in and outside of the religion for century after century. They've been referenced in film (from as far back as 1921), in music and on CD covers from groups as far ranging as Muse to Metallica, Marilyn Manson through "Weird Al" Yankovic. They're a common theme in comics and there are plenty of paintings depicting them. And, of course, they're a convenience with video games. Four supremely powerful knights, representing War, Death, Pestilence and Famine? Bring them together and you've got golden material for everything from RPG bosses to, well, Darksiders' anti-heroes. Darksiders most certainly isn't a faithful interpretation of the Bible's Book of Revelations, or the horsemen. The fact that the protagonist of Darksiders III is a woman representing Fury - which is not War, Death, Pestilence or Famine - should probably clue you in there. 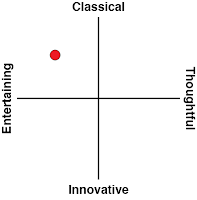 From a practical perspective, that makes sense. War and Death, the protagonists of the first two Darksiders, are thematically appropriate as anti-heroes in a dark fantasy game. Pestilence and Famine... well, those are both much more sinister topics to try to build a protagonist around. Even an anti-hero. It might work for a grim little indie game, but Darksiders sits on the cusp of being AAA. The developers needed to find something more protagonist-friendly. Something like Fury. This casting direction in turn has allowed the developer to create a game that ratchets up the action of the previous Darksiders and de-emphasises the more cerebral elements, like the RPG systems and "Zelda-like" dungeon design and puzzles of the first two. Fury's more of a glass cannon; point her at something and fire. She'll burn with a rage appropriate only for a creature of fury straight from hell, and certainly dish out the damage, but she's also got no patience for puzzles, and the threats she is up against are no slouches in their own physicality either. People have voiced concern that Darksiders III is going to be too different from its predecessors by removing that "Zelda-like" gameplay that attracted so many to the series at the start, but I'd argue that it was necessary they did so. Fury plays like a personification of Fury should, and the developers have absolutely nailed that side of things. Combat is genuinely difficult. I had to dial the difficulty right down to the easiest "story" level the first time I played through, and to date I'm still struggling with the "normal" challenge level at points. 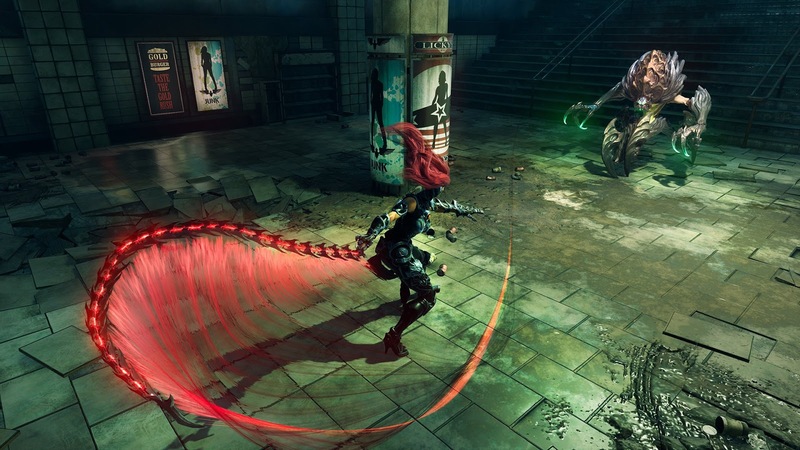 On a basic level Darksiders III is reminiscent of Bayonetta, in which your nimble hero needs to make frequent use of the dodge button, with precise timing, in order to have the best window to counter-attack. 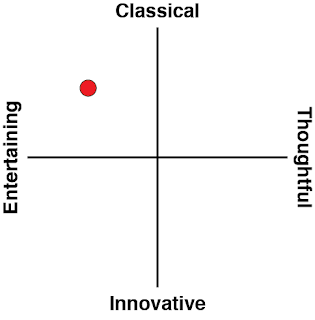 And, just like in Bayonetta, the combat is fast and fluid. I had much more trouble with the dodging, however, because enemies don't project attacks nearly as clearly as they do in other, similar titles. Darksiders III is never unfair, though. You've always got the opportunity to sail through combat encounters with good play (and wow does Fury feel powerful when you do), but you're going to have to pay attention to do so. The hardest parts of Darksiders III are, interestingly enough, not the boss battles. Those battles might be the most challenging in terms of the raw statistics involved (the health of the boss, the damage they do), but I found the surprise in coming across the occasional elite enemy on my journey to be a far steeper obstacle to overcome. By the time I was over the surprise attack and ready to take the enemy on, I had usually lost a big chunk of health already. I also loved that, because it meant the action - and adventure - had a much better ebb and flow than it would have if it concentrated its challenge in the boss battles. Darksiders III has some truly spectacular level design. Rather than being structured as a series of levels, the game instead functions as a single labyrinth, with passages and areas winding off and then back towards one another. I hesitate to say it, because too many people make these comparisons too easily, but the game's level design is reminiscent of Dark Souls at its best, to the point that the environment design becomes a part of the narrative itself, foreshadowing what's to come, and constantly keeping you on your toes. It's also a world filled with little secrets, and those little secrets are often like a light to a month. You'll see something glowing and beeline to it, expecting some kind of loot, only to get walloped by some elite enemy protecting it. The rewards are always worthwhile; the protected items tend to be worth the risky combat, and as a result Darksiders III offers a persistent sense of danger and adventure, up there with the best dungeon delve RPGs, and perfectly suiting the bleak and blasted world of the apocalypse that it depicts. Once you get to those boss battles, they're great fun in their own right. Borrowing again from the Bible, Fury's quest in Darksiders III is to track down and capture the seven deadly sins, and unsurprisingly each battle is in some way either abstractly or explicitly representative of that sin. 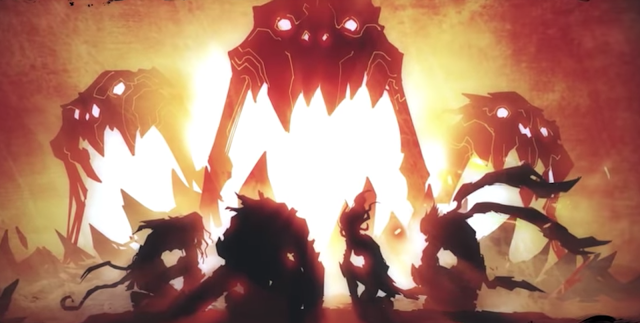 Think about it too hard and you'll realise that since "Fury" is a synonym for "Wrath", Fury herself should probably be over on the other side, but again, Darksiders III borrows from Christian mythology without committing itself to it. What it does mean is that you get seven wildly different boss designs and entertaining fights to work through. As the adventure moves on, Fury develops an almost overwhelming number of different abilities and forms that she can take to overcome those enemies, and other challenges within the game. The winding dungeon layout allows for some "Metroidvania"-like exploration where some areas initially inaccessible become available once Fury has the right abilities to push through them. Impressively, most of the enemies within the game will fall to a range of different tactics, so while the first couple of hours of Darksiders III feels too shallow and grindy for a good action game, over time you'll be able to tailor Fury's approach to challenges to suit your play style. 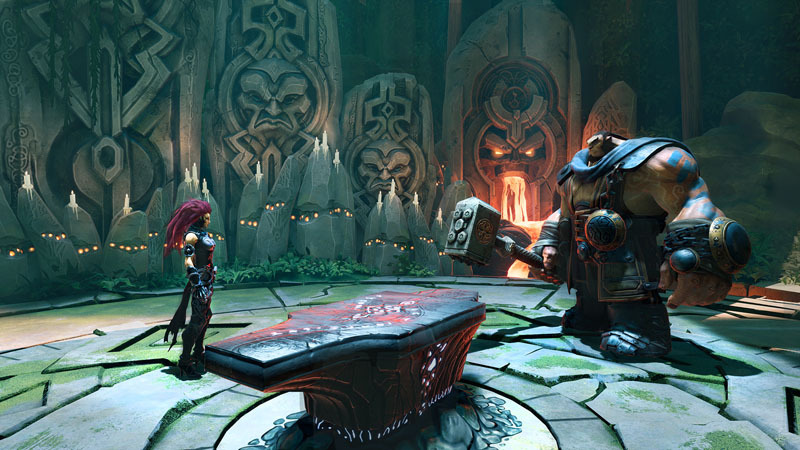 Over the longer term, Darksiders III's combat becomes richer, but the struggles it has with narrative, initially forgivable in the context of a stylish aesthetic and slick gameplay, become harder to deal with. Whether it's a budgetary issue or a lack of refinement from the developers, cut scenes are overly short, and the game doesn't do a good job in establishing an emotional connection with the important characters. This is also party a problem with raw anger - or Fury - being the protagonist. How are we meant to feel for her when her horse is killed (not a spoiler - it happens too early on in the game to count and I'm not saying what happens from there), when prior to that event her one "touching" moment with the horse is her joking about killing it herself? We're meant to care because she bellows in anger at the scene, but there's nowhere near enough character development to get us there. The rest of the time she's perennially angry, and this also tends to clash with her habit of helping humans and other "goodly" folk out when she can. It's under the auspices of Fury being a force dedicated to maintaining balance in the world, but as it's presented it ends up being laboured and inconsistent characterisation. Fury is the weakest character of the four horsemen, though, precisely because she's a more primal force than the others, and one unsuited to any subtlety. It's easy to forgive the developers for the unrefined narrative in Darksiders III as a result. Should there be a Darksiders 4 (and I certainly hope that's the case), the next protagonist to the plate would be Strife, and Strife promises a far (far) more labyrinthine plot involving stealth, deception, and manipulation than any of his brothers or sister. It would need to be a very different kind of game again, so hopefully the team would be able to meet that challenge. 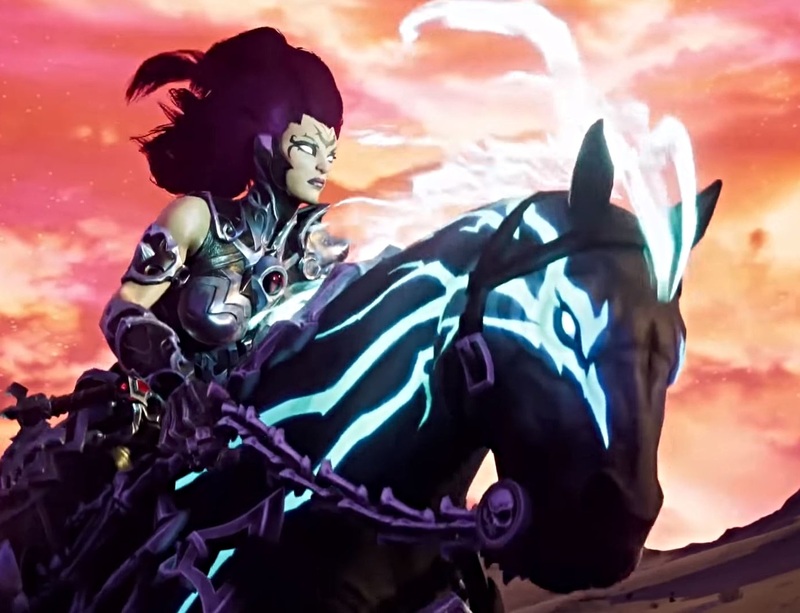 Darksiders III is a fine return for a series that fans were hoping against hope to see again. It was probably a mistake to release it at this time of year, as people are coming down from the mammoth AAA-blockbusters that absolutely dwarf this one for budget and production values. But what Darksiders III gets right - the combat system and that beautiful, intricate labyrinth design - it gets so right that it can hold its head high against the many peers that it has at this at this time of year.